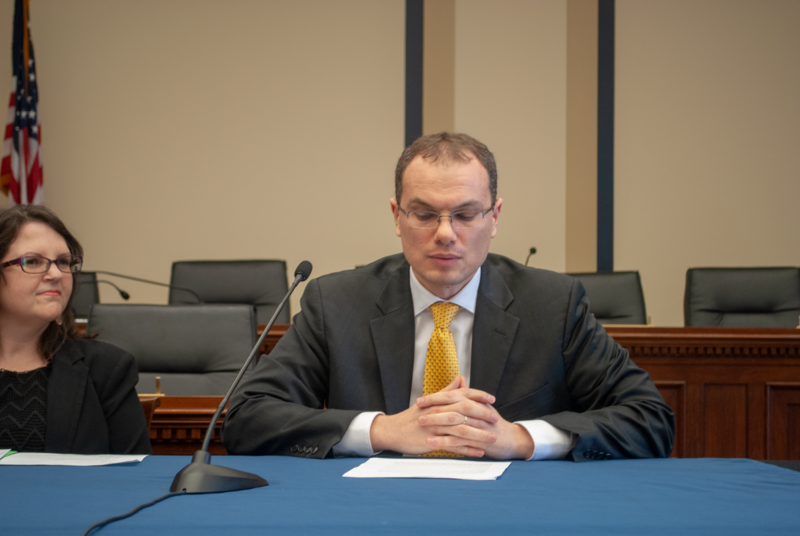 UMBC’s David Di Maria recently visited Capitol Hill to brief Congressional staff on a key issue affecting higher education and the U.S. economy: opportunities for international students. To attend a U.S. university, international students must complete a student visa process, which can be both long and confusing for prospective students, their families, and the U.S. colleges and universities they hope to attend. With numerous immigration and education policy bills pending before Congress, Di Maria and colleagues in the higher education community offered their international education expertise to inform the debate. Di Maria, associate vice provost for international education, spoke during the session “Student Visas, International Students, and the American Innovation Ecosystem.” He and other experts from the education and business communities provided perspectives on issues like visa processing and renewal procedures, the importance of international students to the U.S. economy, and ways to retain international students as members of the U.S. workforce after graduation. David Di Maria speaks at a Congressional staff briefing on policies impacting international students, 2019. Photo courtesy of APLU. Di Maria, who is known as a U.S. expert in the international education community, highlighted that international students “boost innovation, support 455,000 U.S. jobs, contribute nearly $40 billion to the U.S. economy, bring unique diversity to our campuses, and bolster U.S. foreign policy.” According to NAFSA: Association of International Educators, during the 2017-18 academic year, the nearly 20,000 international students enrolled at Maryland institutions of higher education contributed more than $700 million to the State’s economy, and supported more than 8,600 jobs. UMBC has maintained strong international student enrollment, with more than 1,000 international students attending UMBC annually over the past several years. However, many other universities across the country have been challenged by declines in international student enrollments, which can, in turn, negatively affect the economies of individual states and the U.S. as a whole. In addition to speaking about international student enrollments, Di Maria also discussed employment for these students after graduation. Di Maria noted that visa caps and related policies result in U.S. schools producing “highly trained individuals and sending them somewhere else” for employment. He explained that in addition to affecting opportunities for the students, this prevents the U.S. from reaping the economic benefits that these recent graduates will provide when they enter the workforce, a point reiterated by panelist Jon Baselice from the U.S. Chamber of Commerce. Kinu Harichandran, an international student from Pakistan, shared her experience as a graduate student at Georgetown University, where she earned a master’s and is working on a Ph.D. in vaccine research. She recounted the process for renewing her visa during her doctoral studies, and the toll it took on her research because she had to return to Pakistan for the renewal process. When asked for one takeaway for the assembled Congressional staff, Di Maria recommended that the U.S. implement a national-level international education strategy, improve support for students, and adopt immigration policies that allow the U.S. to retain top graduates in our workforce. This, he suggested, could have a major impact by helping the U.S. attract international students, improving their experience, and encouraging them to contribute their skills and talents as members of the U.S. workforce. This story was written by Mary Ann Richmond ’93, history. Featured image: David Di Maria, associate vice provost for international education, in the UMBC Commons. Photo by Marlayna Demond ’11 for UMBC.